Is there anything more beautiful, or rewarding, than feeding the wild birds native to the Hudson Valley? What joy a birdfeeder full of birds brings to our customers whether they are one year, or 99 years old. At Woodstock Hardware we have been helping our customers feed the local wild birds for more than twenty-five years. There is no more rewarding experience than helping someone new to feeding the birds get started with the right bird seed and feeder or helping a seasoned veteran “squirrel proof” their existing bird feeder setup. Squirrel proofing a bird feeder can be one of the biggest challenges we face! And it is not that we have anything against the squirrels. Actually, we sell feeders and feed aimed at feeding the squirrels. There are just many wild bird feeding enthusiasts that like to keep their feeders from being ravaged by the squirrels and do not wish to feed them select bird feed mixes. 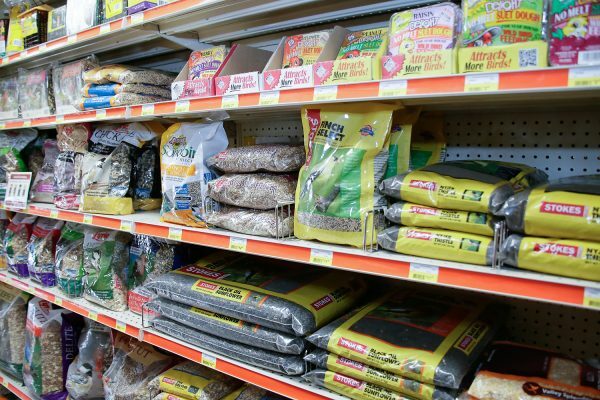 Woodstock Hardware carries one of the best selection of wild bird seed and wild bird feeders in the Hudson Valley. To support the efforts of our customers who care for the wild bird population, our bird feeder selection includes perching feeders, thistle, suet, platform feeders, and hummingbird feeders. Look close enough and you will even see a few bird houses and even a bat house mixed in. We also keep a selection of basic and supreme, as well as, specialty bird seed mixes in a variety of sizes to meet our customer’s needs. Our customers with limited space are happy to buy bird seed in five and ten-pound bags. While others with more room, or larger needs, enjoy our selection of twenty, twenty-five, and forty-pound bags. And we stock a variety of suet and snack cakes to meet the needs of our local wood peckers, nut hatches, and other interested feathered friends. In addition to the selection of Wild Bird Seed and Wild Bird Seed Feeders and accessories Woodstock Hardware can also provide you the technical expertise required to help you successfully feed the local wild bird population so that you, your family, and friends will share the joy Mother Nature has to offer. Birds are seasonal creatures of habit. Some species that eat seed at your feeder all winter long switch to insects or fruit during the spring and summer. And most birds take the bulk of their diet from natural sources of food, rather than at our feeders. So, the goldfinches that stayed around until May, may be off eating weed and flower seeds in nearby meadows. A healthy natural crop of seeds, berries, fruits, and insects is most likely the answer. Be patient, and the birds will return to your feeders once the natural food stores begin to dwindle. One final possibility: a predator may be stalking around your feeder, forcing the birds into hiding. Look for a cat or hawk in your yard if your birds disappear all of a sudden. We hope that these questions and answers help you better understand what is going on in your back yard and that you will be able to better care for your birds knowing the answers. 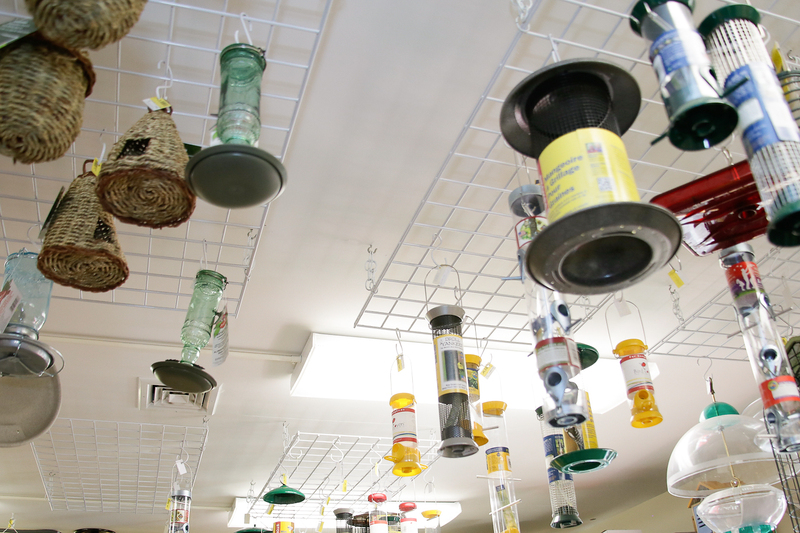 Woodstock Hardware is a destination for local enthusiasts who enjoy feeding the wild bird population. Who does not enjoy seeing their feeder full of bright yellow gold finches? Or a small flock of buntings scooting around under the feeder? Or a red headed woodpecker hanging upside down on a suet feeder? I mean, wow!